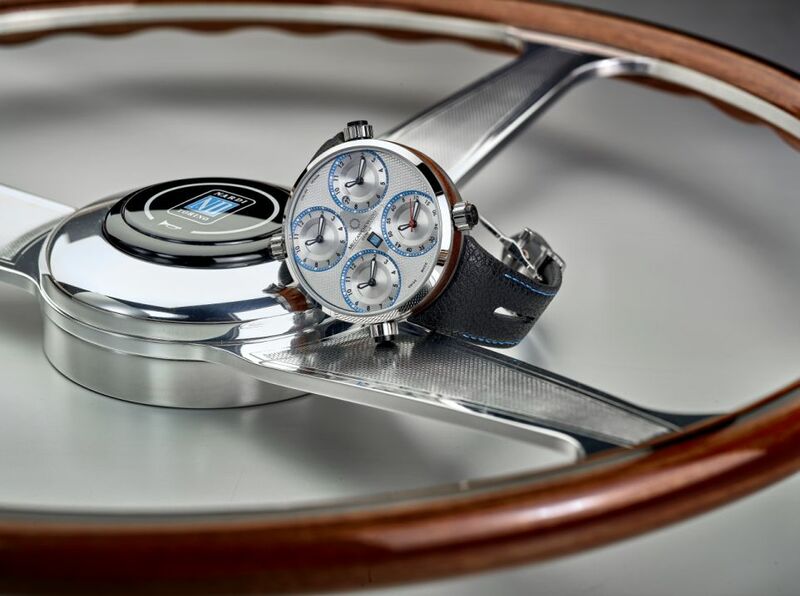 Meccaniche Veloci presents a unique timepiece from the QuattroValvole collection, the fruit of a collaboration with Nardi, the Italian firm that makes traditionally-crafted steering wheels. In the words of Cesare Cerrito, CEO of Meccaniche Veloci - Genève: "The engineer Enrico Nardi was an extraordinary character, one of the men who made automotive history in Italy together with personalities of the calibre of Carlo Abarth, Vincenzo and Gianni Lancia, and Enzo Ferrari. The racing car driver, trainer and designer of everything car-related first became a test pilot for Ferrari in the 1940s, then Enzo Ferrari's right hand man. For Ferrari, in the late 1950s he designed and produced his first steering wheel made of precious wood. Ever since, Nardi steering wheels have been fitted in the fastest, most beautiful and victorious vehicles in the motor racing world, including the legendary Ferrari 250 GTO. It is a great privilege for me to tell the story of this brand, which remains truly extraordinary to this day, through our watches. We share its entirely Italian passion for finding beauty in functional things, as well, of course, as its roots in the extraordinary world of engines." 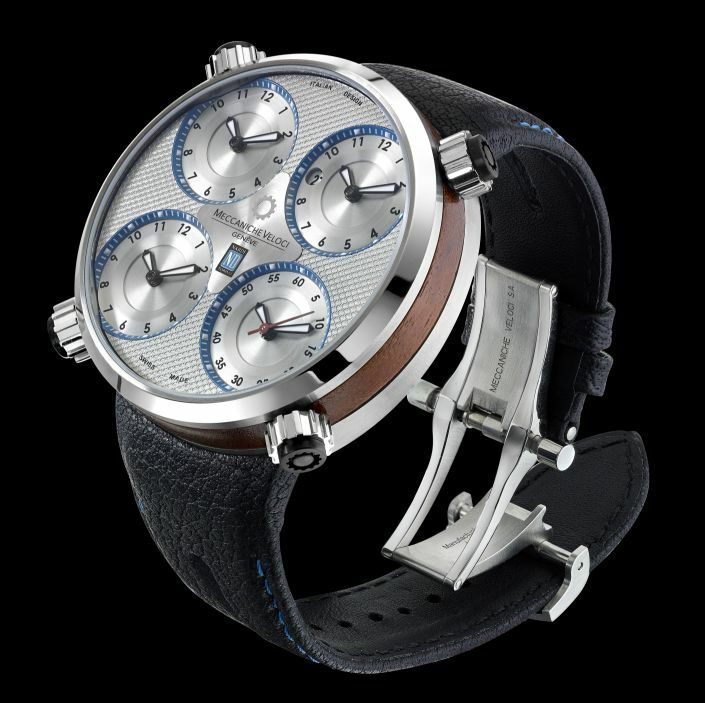 "We are excited to be working with Meccaniche Veloci to produce an exclusive watch with unique character, just like our steering wheels", says Lorenzo Cerofolini, CEO of Nardi-Personal SpA. "We share Meccaniche Veloci's passion for cars, beauty, precision and attention to detail, all factors that ensure our products are admired and renowned the world over. Nardi steering wheels provide all the pleasure of direct contact with high-end materials such as natural leather and hand-crafted and -finished precious wood, and represent a unique choice in terms of design and comfort. There is a different choice of grip for every driving style. A Nardi steering wheel is a classic. Time passes, but a Nardi steering wheel remains a dream come true!" The case, in titanium with wood insert, measures 49mm. It has an AR-coated sapphire crystal, a display back, and it is water resistant to 50 meters. Movement is the Swiss automatic MV in-house caliber 8802 with 33 jewels, 28,800 vph and a power reserve of 48 hours. Perlage finishing. It features four independent timezones. Main dial, Hour, minute and date at 9 o'clock Ancillary dials, Hour, minute, and seconds (1) / hour and minute (2). 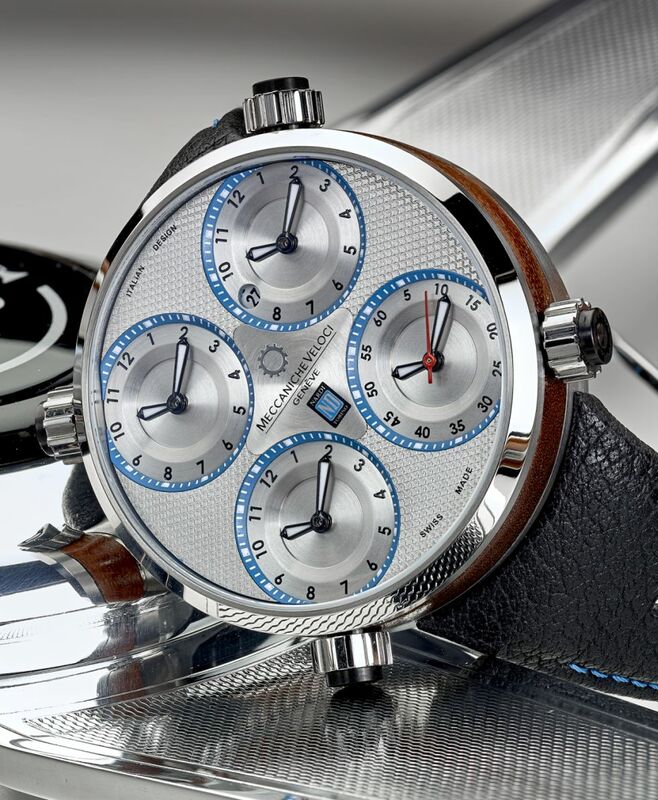 It has a guilloche silver weave dial with Nardi logo. SuperLuminova hands and indices. 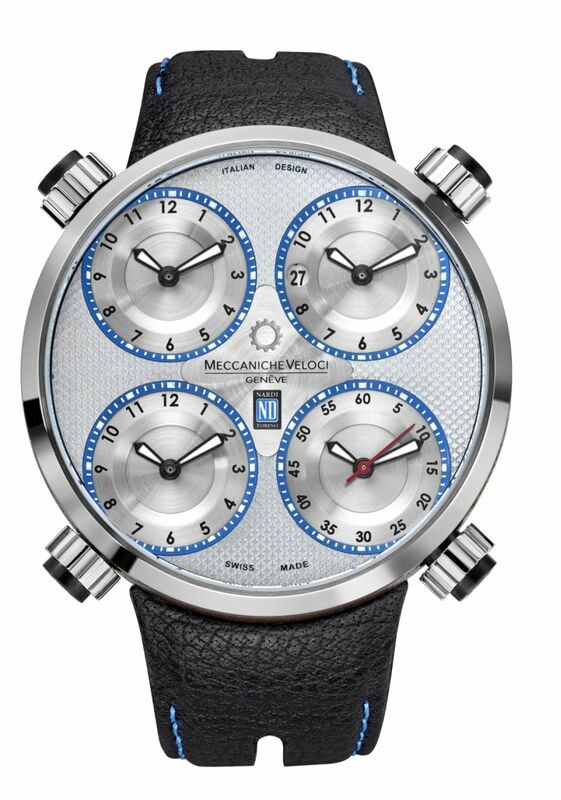 The four small dials are edged in blue in tribute to Nardi's colors. It comes black leather strap with light-blue stitching and a steel folding clasp.